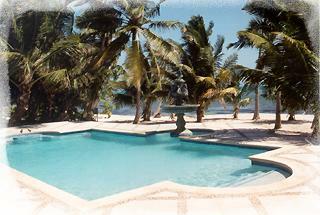 Casa Tortuga "Our Belize Vacation" - "Our Belize Vacation"
Casa Tortuga is a luxurious two-story five bedroom villa on the beach in San Pedro, Ambergris Caye, Belize. 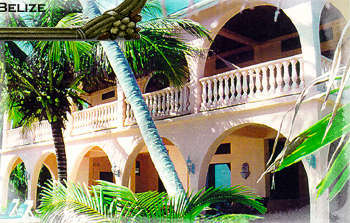 Casa Tortuga has 250 feet of beachfront and is surrounded by 73 coconut palms. 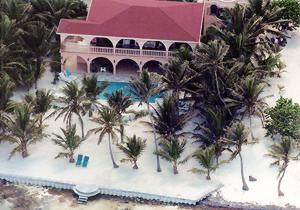 The villa is located 1 3/4 miles south of San Pedro, which takes six minutes by taxi van. Guides can pick you up at our dock for scuba diving, snorkeling, fishing and sightseeing. There are bicycles, golf carts, and taxis available for transportation. The taxi fare from the villa to town is $10.00 US dollars per van, which seats up to ten people.The pale pink villa consists of 5,280 sq. ft. including 60 ft. verandas on both levels, facing the sea Located on the upper level are two large bedrooms, the living room, bar, 2 baths, large kitchen, and a dining area, as well as a dining area on the veranda. 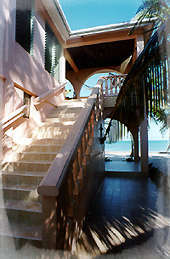 The beach level includes three bedrooms, three baths, and a 60 ft. veranda on the waterfront. We also have a giant chess set on our beach. The king is three feet tall. Enjoy a grand game of Chess under the palms! 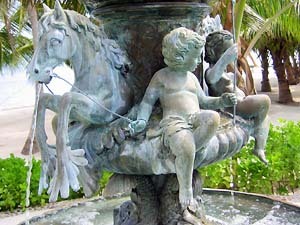 The Casa Tortuga Villa fountain is from Versailles, France, and was created in 1789 of bronze. 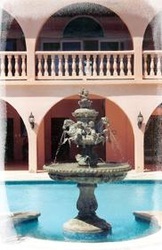 The fountain is eight feet tall, and stands on a four foot high pedestal in an alcove in the pool at Casa Tortuga. The bronze horses and cherubs depict the Louis XV French style, which was prominent in France at the end of the seventeenth century. The fountain was originally puchased by Henry Flagler of Palm Beach, Florida in 1890, when it was brought from Versailles, France to Palm Beach. 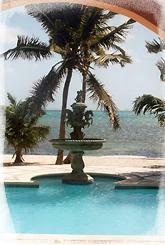 In 1994, the fountain was purchased by Peggy Mason in Florida and transported to Casa Tortuga Villa in San Pedro, Belize, where is now resides. If the bronze horses could talk, I am certain that their stories would be entertaining! 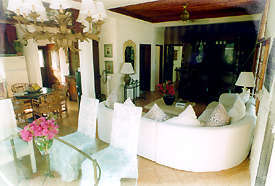 The living room has a white sectional sofa and a coffee table from India made from a wrought iron window designed to keep the monkeys at bay. The living room also has two sets of french doors opening onto the veranda. 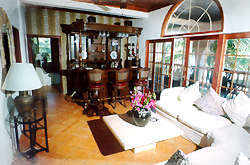 The antique walnut bar seats three at the front, and has a back bar with curved glass and shelving. The ceiling of the bar holds the stemware and lighting. The dining table is oval glass with a brass base and white Parsons chairs. A large leafy chandelier with white shades light the dining area. Monkey candelabras and bougainvillea serve as a centerpiece. The full kitchen is on the second level and it is where Maria and her assistant prepare your meal. All of the cabinets, doors and ceilings are mahogany. The kitchen has a table and seating for four. An 8 ft. tall antique walnut china cabinet contains the glassware and china service. 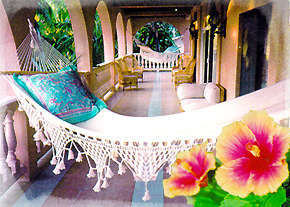 The upper level veranda is 60 ft. long, with Pawley Island double hammocks at each end. There is a comfortable wicker lounge, chair and ottoman with plush oversized white cushions at one end of the veranda, and the other end has two tables with high back Queen Anne chairs that can be joined for outdoor dining. In the villa, there is a plentiful supply of games in the bar, and volleyball is available as well. A set of horse shoes set up under the palms. 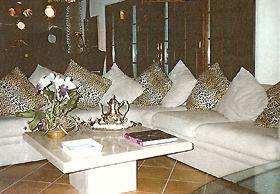 The villa is also equipped with color Cable TV, a VCR, tape player, a DVD player, and CD player. To make long distance calls from the telephone at Casa Tortuga Villa, you will need to purchase a calling card on the island. 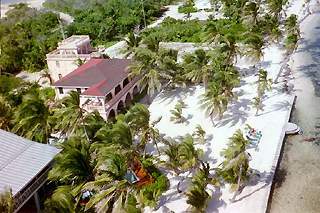 Activities in the area include snorkeling, scuba diving, fishing, sailing, windsurfing, parasailing, sea kayaking, jet skiing, and daily snorkel excursions to the nearby island of Caye Caulker on a skiff or catamaran. There are boat trips to the ancient Mayan ruins of Altun Ha and Lamanai, as well as a daily flight to the largest Mayan ruin in Central America, Tikal, in Guatemala. San Pedro is a quiet village with friendly English speaking inhabitants. Island law dictates that no buildings be taller than a palm tree, so fortunately, three stories is the maximum limit on the island. The restaurants in San Pedro serve great food at average prices, although we believe that our staff at Casa Tortuga cook the most delicious food on the island! The lobster in Belize is also excellent. The Belizeans on the island are happy, content people, and the atmosphere is delightful. Our staff live on the property, and take excellent care of our guests. Daily maid service is included in the rent. Maria and her assistant prepare three meals per day for our guests. 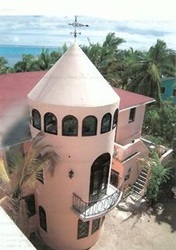 She will have regular or virgin piña coladas and appetizers for your arrival at the villa. For your Arrival Dinner, she usually makes a typical gourmet Belizean meal from the island's fresh produce and the catch of the day. You may choose to bring gourmet coffee with you. There is a $400 deposit for the initial groceries for the first few meals. After your arrival, you can plan the other meals with the cook, and give her grocery money as needed. Groceries usually cost $120 - $150 per person, plus liquor, for the week. 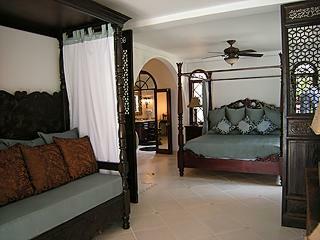 The master bedroom, the Tortuga Room, on the upper level has a king canopy bed. The closet doors are mirrored and the room is furnished in antique dark green Captain's furniture hand painted with clipper ships. 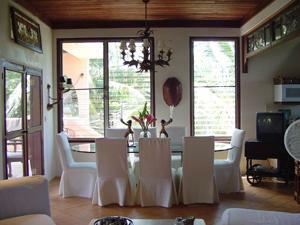 This bedroom has two sets of french doors which open onto the veranda overlooking the Caribbean. 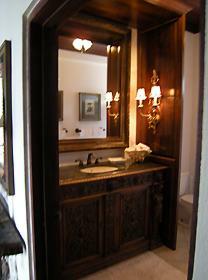 The upstairs Tortuga Room bath has a shower, bathtub, and an antique carved vanity from Germany, with a marble top. The gold sconces with silk shades provide excellent lighting, as well. 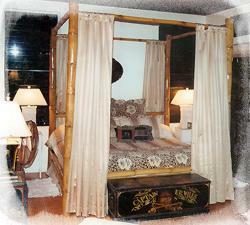 The Jungle Room is the second upper level bedroom which has an eight foot high king canopy bed. At one end of the room is a mantlepiece under a large carved mirror. The Jungle Room has a bathroom in a turret, with an 18' high dome ceiling, and sixteen arched windows surrounding the top of the dome.This bathroom also has antique stained glass french doors opening onto a french wrought iron balcony, which overlooks the gardens. The third bedroom is the lovely Palm Room. This is the largest bedroom at Casa Tortuga, which is 432 square feet. The king canopy bed is hand carved, as is the canopy daybed in the entrance hall. The mahogany day bed has carved monkeys, and was made in Guatemala over a hundred years ago. The 10' long altar table in the entry is from China, and made from a single tree. The open fretwork partitions between the entry and the bedroom are from Bali. The dressing room includes a white damask sofa from England, under a large gold leaf mirror, flanked by gold monkey sconces. The Palm Room bath is in a turret, with three diamond paned windows looking out onto the gardens. The hand carved vanity is mahogany, under a large mirror and two Napoleon sconces. 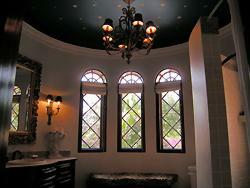 The ceiling is blue with gold stars around the large chandelier in the turret bathroom. 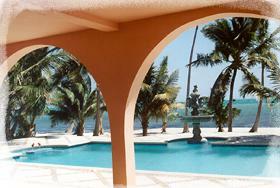 The second beach level bedroom is the Seabreeze Room, which opens onto the pool and beach beyond. The view of the Caribbean is lovely from this room. The headboard of the queen bed consists of a pair of antique carved wooden doors from the eleventh century. The two Louis XVI chairs are covered in a zebra print. The draperies for the eight foot high french doors are deep rose damask with tassel fringe. 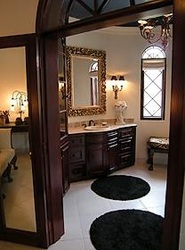 The Seabreeze bathroom has a dressing room with the vanity in a chest and marble top. It is tan with cream wainscoating. The shower has tan and cream bas relief tiles from Portugal. 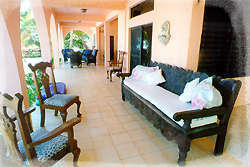 The pool veranda has highback wicker chairs surrounding a cream granite coffee table. The beach level has three additional bedrooms. 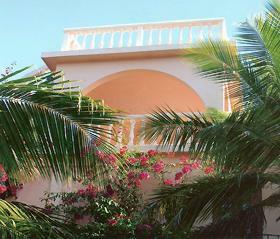 The Maya Room opens directly onto the veranda and beach. The view of the turquoise Caribbean from the canopy bed is wonderful. 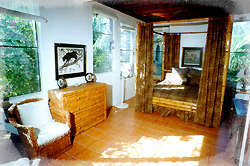 This room is accented with Mayan artifacts and paintings of jaguars. There are more jaguars in Belize than in any other country in the world. They inhabit the rainforest on the mainland of Belize. The Maya Room bath has a tub and a shower.